In the flying and static displays, the company will showcase its modern and highly efficient range of commercial aircraft able to seat between 100 and more than 600 passengers. The static display will feature two A220-300s (a test aircraft and an airBaltic aircraft), which, along with the smaller A220-100, represent the newest members of the Airbus single-aisle Family following the recent agreement to take a majority stake in the 100-150 seat aircraft program. An A321neo will also be on display on the Wednesday of the show week. Airbus’ latest wide-body models, the A330-900neo and A350-1000, will each participate in the Farnborough flying display for the first time. The A330neo, which features new wings and new generation engines, is due to go into service in 2018. Meanwhile, the A350-1000 offers the very latest in aerodynamics and advanced technologies to provide unrivalled efficiencies on long-haul routes. An A330-900neo of launch customer TAP Air Portugal and an A350-1000 of launch operator Qatar Airways will also be on the static display. At the larger end of the firm’s portfolio, a Hi Fly A380 will be on static display during the latter part of the week showing the flexibility of the double-decker aircraft. Meanwhile, Airbus Defence and Space will demonstrate its broad product portfolio of military aircraft, space systems, secure communications and UAVs. An A400M military transporter in special Royal Air Force colors will take part in both the flying and static displays. Equipped with state-of-the-art technologies, the A400M can perform strategic and tactical transport missions and also undertake air-to-air refueling. Also featured will be the world record holding Zephyr, Airbus’ solar-electric stratospheric unmanned aircraft that combines the advantage of a satellite with the flexibility and persistence of a UAV. Airbus will showcase its world leading secure communications networking and cyber security capability at one of the interactive ‘bubble’ displays at the Airbus Pavilion. Space expertise will feature strongly, including the environmental monitoring program Copernicus where Airbus designs and manufactures Sentinel satellites. In the show’s ‘Space Zone’, Airbus will exhibit the ExoMars rover prototype that will drive on a simulated Martian surface. The ‘Network for the Sky’ airborne communications solution will also be presented for the first time. The interactive ‘bubble’ displays in the Pavilion will present four broad key themes for Airbus by illustrating certain related activities. The ‘Future of Flight’ display will show how Airbus is further improving its portfolio and changing the future of mobility with aircraft such as the single-aisle A321LR that can serve new long-haul markets, the H160 helicopter and Urban Air Mobility initiatives such as Vahana and CityAirbus. The ‘Secure World’ display will showcase Airbus’ vision for defense and security including the Future Air Power family of connected systems to respond to the threats of tomorrow. The ‘From Data to Insight’ display will demonstrate how Airbus is harnessing the power of data through digitalization initiatives such as the Skywise data platform. Another display area will demonstrate how Airbus is committed to developing a sustainable future together with its key partners and stakeholders. Featured projects include the Blade wing laminar flow demonstrator program conducted under the European Clean Sky research program. As the second largest supplier to the Royal Air Force and biggest supplier of large aircraft, Airbus will also show its strong support for the RAF’s centenary celebrations. 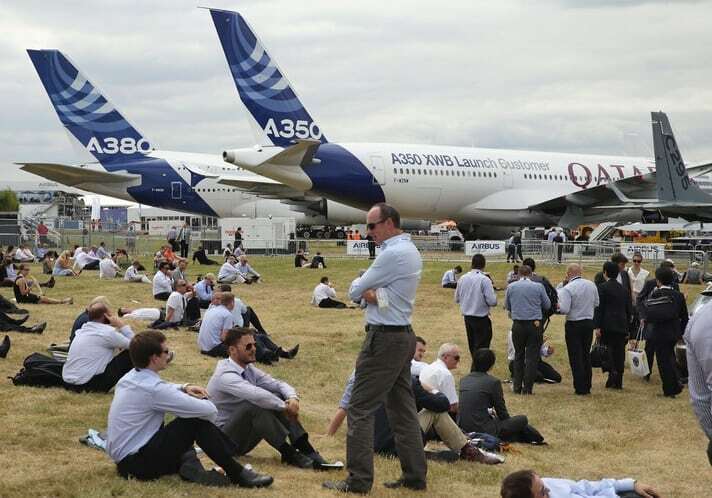 The Farnborough International Airshow runs from July 16 to 22. Accredited journalists are welcome to visit the Airbus Pavilion’s dedicated press area (OE13) where the majority of announcements will be made. Updates will be available on a dedicated event page of the Airbus Website while aircraft visits can be arranged for accredited media at 09:30am each week day.